Is everyone done decorating for the season yet? Having that “extra” week in between Thanksgiving and December allowed me to get our home holiday ready by December 1. We still need to get our tree and do our outside lights (actually no “we” involved in the latter!) but the home is feeling festive and fun. We even managed to get our first batch of Christmas cookies baked this weekend! When it comes to holiday decorating has your style changed over the years? Do you have traditions or collections you add to and put out each year? Do you decorate one room or many rooms? 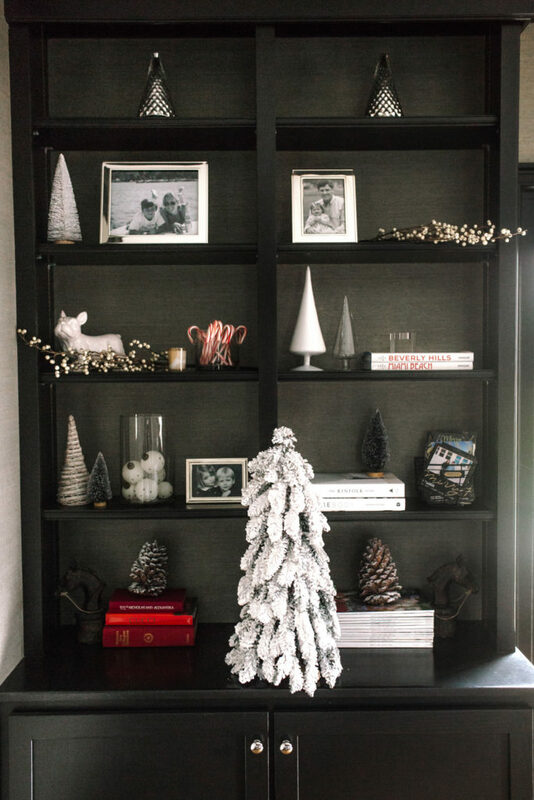 Where are your go-to sources for holiday decor? I remember when we were first married we had our Christmas tree and our mantle decorated in the living room and that was it. And truthfully, up until last year, our holiday decor was a bit sad. However last year, we did a complete living room holiday decor overhaul, and now I want to feel the magic of the holidays in every room! I love bringing the outside in and have either fresh Balsam wreaths or faux foliage wreaths in just about every room (If you missed my post, “A Cozy Bedroom for the Holidays” head here). White and green are my go-to color choices and you know I will incorporate faux fur just about anywhere I can! In terms of decorating sourcing, I found that that the Hearth and Hand Collection from Target, CB2, Crate and Barrel and of course my favorite local resource, Seasons 440, were my constant go-to’s. 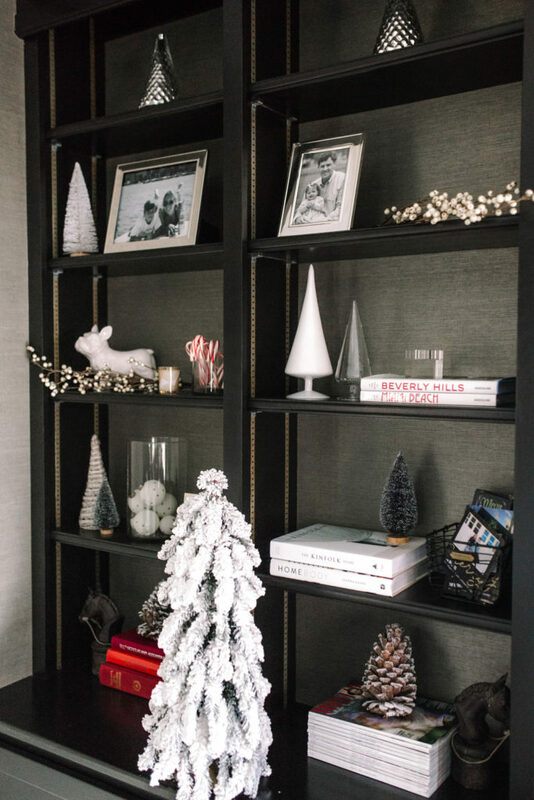 I thought I would share how I decorated our family room bookshelves this year with my favorite holiday retailers. (For a look at our living room from last year, head to this post here). Our family room (the hub of the house!) does not have a lot of surface space to work with other than the bookshelves. So this needed to be the focal point of our holiday decorating for this room. Bookshelves in general can be tricky to style. I find that if you fall back on keeping things as monochromatic as possible though, it usually turns out well. Also, don’t hesitate to “shelve” items that don’t work. See those cabinets? They are filled with books and accessories that just were not working into the holiday theme! Working with very dark stained wood, I knew that incorporating white and reds would be an instant standout. 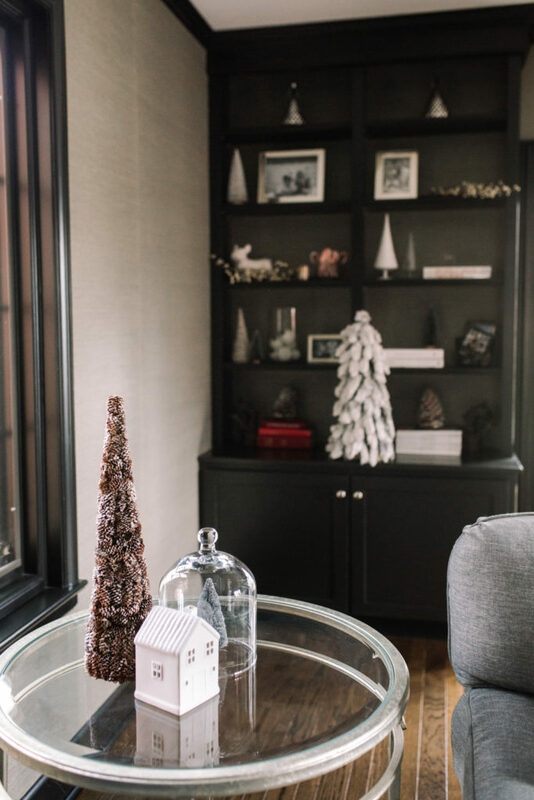 Taking glass containers and filling them with holiday items like ornaments and red and white candy make for a festive addition. I also made sure the books and magazines displayed were only red and white. Again, I love bringing the outside in. My husband drew the line of me hanging a nail for a wreath at the top of the wood bookcase though (Grinch!). So instead, pinecones, branches and my beloved white Aspen trees did the trick! Finally, I added a collection of Christmas trees of different sizes and textures to display. It would be really fun (and if I was really organized) to switch out all the picture frames and incorporate your holiday card pictures over the years!